It was supposed to be an epic shot, instead it turned into an epic failure! It happened when the University of Hawaii played New Mexico State during the 2009-2010 football season. It was late in the game and the Hawaii Warriors had a comfortable lead. Hawaii had the ball on about the New Mexico 35 yard line and I was positioned at the back of the end-zone near the goal post. Hawaii Quarterback Bryant Moniz dropped back to pass and surveyed the field. 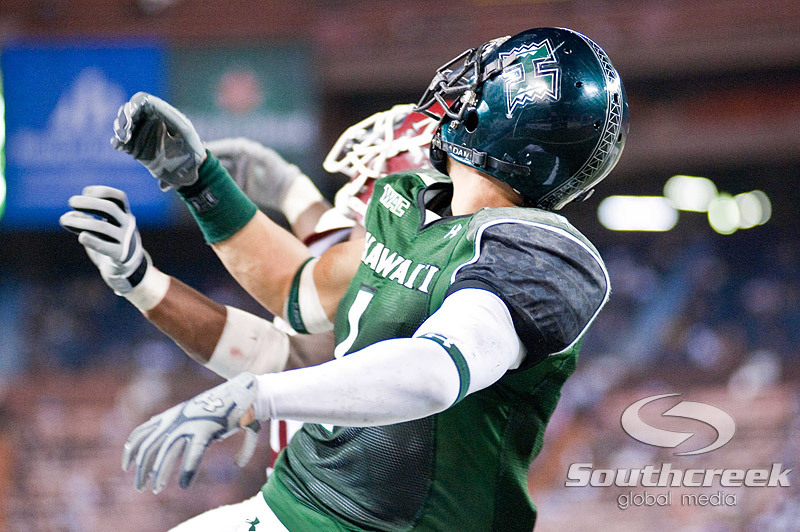 Out of the corner of my eye I saw Hawaii's star receiver, Greg Salas running a post route toward my direction and saw Moniz look toward him. I immediately focused in on Salas and the New Mexico defender, thinking that I was going to get a nice shot of Salas grabbing a touchdown pass. My focus was really tight and all I could see was Salas and the defender looking up for the ball. At this point, I'm was just waiting for the ball to drop into my frame for the perfect shot. I waited for what seemed like minutes for the ball to drop into the frame, but it never came. Finally I realized that the ball was over thrown and both Salas and the defender were headed straight towards me. I looked up from my camera, but it was too late, I tucked my head and hoped for the best as the two players steamrolled into me. At this point everything seemed to be happening in slow motion. I was at the bottom of the pile wondering if I was hurt or not. My ankle was sore and I figured it was broken, but I remember thinking that if I came out of this with only a broken ankle, I'd be lucky. I remember being helped up off the ground and looking at my ankle (fully expecting it to be twisted or contorted at some weird angle) it was sore but it looked ok. My first thought was, "where's my camera" (I was sure it had gotten damaged). I looked around and saw it laying on the ground about 10 feet from where I was. The monopod it was attached to was bent, and I could see that the lens hood had been pushed all the back to the camera body. I hobbled over to pick up my equipment and feared the worst. I took a quick look and noticed that my lens hood was cracked, but there was no visible damage to the lens itself. I framed a shot and took a picture, everything seemed to be in working condition, what a miracle. After being helped from the field, I sat in the dugout and took my shoe off. HOLY CRAP, my ankle looked like it belonged to an elephant! It hadn't been more than 3 minutes and it was already all bruised and swollen. I was given a bag of ice and the team physician was called to take a look at my ankle. After looking at my ankle, the doctor determined that my ankle was probably not broken, but that I should probably see my regular doctor ASAP for Xrays. As it turned out, my ankle was severely sprained, but not broken. It's been a year and a half and my ankle is still not back to 100%, I don't think it ever will be. My First Great Action Shot!